A recently published study in the Canadian Medical Association Journal has concluded that women who take NSAIDs in the first trimester of pregnancy are more than twice as likely to have a miscarriage than women who do not. NSAIDs, or non-steroidal anti-inflammatory drugs, are a very popular class of pain killers that many people use every day. They are also used to reduce fever. The new study investigated use of non-aspirin NSAIDs such as ibuprofen, naproxen and other drugs. It is estimated that about 17% of women use non-aspirin NSAIDs during pregnancy despite the already existing knowledge they can cause malformations. The problem with this is NSAIDs are seen by many patients as basically harmless medications because their use is so incredibly common. NSAIDs are also available over-the-counter and do not require a prescription to buy. There is nothing stopping a pregnant woman from going to her local CVS and buying a bottle of Motrin to alleviate that pesky headache or continuing to medicate her chronic back pain. The Canadian study compared the medical records of 4,705 women who had a miscarriage during the first 20 weeks of gestation with records of 47,050 women who became pregnant and delivered a child. The women in the study were aged 15 to 45 when they became pregnant. Among women who had miscarriages, 352 had taken NSAIDs, compared with 1,213 of the women who did not experience pregnancy loss. When calculating the risk associated with NSAID use, the researchers accounted for other factors that might increase the likelihood of miscarriage, such as diabetes, high blood pressure, heart disease, asthma, lupus, rheumatoid arthritis, depression and anxiety. Taking into account all of that information, the risk for miscarriage was 35% for women taking NSAIDs as compared to the usual rate of 15%. That jump is quite significant. Imagine if the average miscarriage rate was actually 35% and not 15%. That would mean more than one out of every three women who became pregnant would have miscarriages. That would truly be a worrisome number. To me, this signifies that we need to stress to pregnant women that they should seek more conservative ways to manage their pain. Head aches, neck pain, back pain, cramping and many other forms of pain are things that chiropractors deal with on a daily basis with success. There is very little side effect, if any, to manipulation. And there certainly isn’t an increased risk of miscarriage! In traditional medical care NSAIDs are thought of as conservative care. I doubt there are many responsible medical physicians who would recommend a pregnant woman take an NSAID because of the risk already associated with them, but the problem is they don’t have to. These drugs are so readily available and people have been taught this is an acceptable form of conservative care. They are not. Additionally, they provide only temporary relief. Chiropractic care actually addresses the issues at hand and is corrective. This is something an NSAID can never claim to be. Most people, pregnant or not, deal with some form of pain from time to time. Still others deal with it frequently. Unfortunately, most of those people reach for the bottle of pills to relieve the pain but not actually correct the problem that’s causing it. Next time that happens, consider trying chiropractic as an option. Not only will it relieve your pain, it will fix the problem too! The ingredient they tested, docosahexaenoic acid, or DHA, has been shown repeatedly in other studies to be helpful for women and their babies. Unfortunately, this study, because of where it has been published, will get all the headlines and I fear that some people will decide that fish oil during pregnancy is unnecessary. This couldn’t be further from the truth. This study followed roughly 2400 women from less than 21 weeks gestation to birth and analyzed data regarding the mother’s mood postpartum and the child’s cognitive development at 18 months. 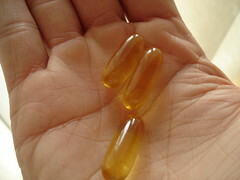 Half of the participants were given fish oil containing 800mg/day of DHA and half were given a vegetable oil placebo. What the study found was that depression scores in women taking the DHA were the same as the women taking the placebo and the cognitive development of the children was the same at 18 months regardless of intervention. While you cannot argue with the findings of the study (they found what they found) I do have a problem with the implications this makes for high DHA fish oil. Many studies have concluded that fish oil and DHA in particular is important for improving brain function. Observational studies have shown that consumption of fish oil reduces postpartum depression and raises the I.Q. of children. This is in direct contrast to what this study has concluded. A 2003 study showed that children with higher levels of DHA had higher I.Q. scores at age 4 than controls. Other benefits are known as well. Fish are a rich source of long-chain omega-3 polyunsaturated fatty acids (PUFA), essential nutrients that have important structural and physiological roles in several body systems, including neurological, immune, and cardiovascular. Because humans cannot synthesize omega-3s, these nutrients must be consumed in the diet. Conversion from the parent omega -3, (linolenic acid), to the more biologically active long-chain omega-3 DHA and eicosapentaenoic acid (EPA), is inefficient and therefore consumption of some preformed omega-3 is important for optimal health. Perhaps this recent study was unable to properly assess cognitive performance at 18 months. It is much easier to assess in a 4 year old. Also, the benefits may not be seen until later in life. In a society where we want results immediately it is easy to understand why they would try and observe for the benefits of DHA at only 18 months. However, a very real possibility exists; maybe these benefits are not observable that quickly. Are the negative effects of a bad diet on heart disease observable in a 20 year old? Of course not. We must wait much longer (perhaps until the person is at least 45) to clearly see the cause and effect relationship. This example perfectly illustrates the fact that not all relationships are readily available directly after treatment. Unfortunately, these studies continue to employ a drug based research approach to nutrition. They are separate entities and need to be researched accordingly. Another possible flaw is that they did not assess dietary intake of omega-3s in the study participants. This is problematic because it is possible patients already had enough DHA to provide the benefits. It is also possible that the control group ate more fish and therefore had enough serum DHA to skew the results. This is something that should be addressed when this is studied again. A third flaw is that this supplement provided 800mg/day of DHA with only 100mg/day of EPA. Research is mixed on the effect of EPA on depression and brain function. However, many authors argue that EPA is important in this picture and this study failed to take that into account. Their goal was to test high dose DHA but we must consider that hardly anything in nutrition works in isolation. It almost always works in tandem with other nutrients. This is again an example of a drug based research approach to nutrition. Drugs are tested in isolation and work in isolation because they are synthetic. For that reason they cannot work synergistically with the body. The body has no innate chemical pathway for them to work with because they do not exist in nature. This allows them to work independent of the body’s systems but also allows them to be tested independently. Nutrition is not like that. Not one bit. One good thing about this study is that DHA was shown to be safe with virtually no side effects. This is good because women can continue to take fish oil without any fear of negative effects on their babies. The bottom line is this: fish oil supplementation has been shown repeatedly to be beneficial for many factors in health. There seems to be little down side to taking fish oil. This recent study is just one study. It will unfortunately get a lot of press because it was published in JAMA. I will continue to encourage my patients to take fish oil during pregnancy because the vast majority of research is positive and I am confident that it is a benefit to my patients.